The Relative Rotation Graph above highlights the rotation of IRM (Iron Mountain Inc.) in comparison to the other stocks in the S&P Real-Estate sector (XLRE). 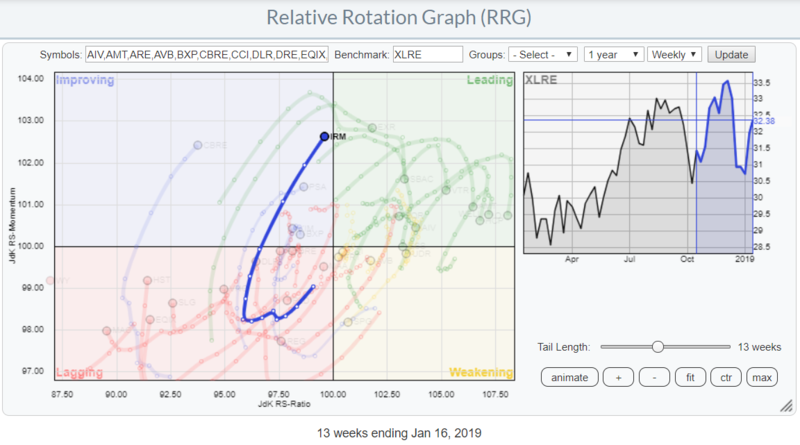 The sector itself is interesting to keep an eye on as it is positioned well inside the leading quadrant but rolling over, at high JdK RS-Ratio levels, on the weekly RRG. But it is inside the lagging quadrant and curling up on the daily RRG. This setup suggests a longer-term (weekly chart) relative uptrend that goes through a pause/correction (daily chart). Assuming that the weekly trend is providing the long-term framework, the rotation through lagging on the daily RRG could be a good point to start looking for re-entry and find interesting stocks within the sector to play.